I took a class called American Cuisine. Each week we would focus on a different region of America, to familiarize ourselves with its flavors, historical influences and topography, and how they informed the table tops in this part of the country. One week was all about Tex Mex. Texas is its own unique state, unlike any other. 'Tex-mex' cuisine was born out of poor man’s Mexican food and includes corn, pinto beans, tomatoes and chilies. Think cowboys, rodeos & ten gallon hats. Lone star chili, Longhorn cattle and chuck wagon cooking. Tex Mex owes its evolution and heritage to inventive cooks who had limited ingredients. The beef and chilies associated with Texas came from Spanish and Mexican heritages. Texas is known for its chilies, salsas, fajitas and tacos. I love this tidbit: the state dish is chili and the state plant is prickly pear cactus. Ever here of a prickly pear margarita? Texas is a large state and its culture and cuisine has been influenced on every border. In the East, Texas borders Louisiana where early plantation owners introduced Southern hospitality and Cajun and Creole cookery. The lower plains of the east are filled with rice fields, wild poultry and game, wild fruits and berries. Today, heavy industry crowds the east coast and its wealth comes from immense, rich oil fields. Southeast Texas boasts a coastline, and unlike the rest of the state, is bursting with shrimp, oysters, finfish and crab from the Gulf of Mexico. Southern Texas enjoys a subtropical climate and year round growing season. The Rio Grande Valley (at the very southern tip of Texas) produces over 40 crops; today the primary crops are cabbage, onions, carrots, peppers, broccoli, citrus fruits, cantaloupes and honeydew melons. The onion is the #1crop. The center of the state has a ‘German belt’; many Germans came to Texas when land grants were available. They were joined by Czechs and Poles. Texas benefited from their sausage-making and meat-smoking. West Texas is typified by ranches: land was granted to Mexican families from the king of Spain for the purposes of raising beef cattle. Texas Longhorns---descendants of wild cattle left by the Spanish in the 16th century---were popular because they could handle the extreme desert heat. Today ranchers also raise Hereford, Brahma and Angus cattle. Other meats now raised in Texas include bison, ostrich, emu, venison and antelope. Like eastern Texas, western Texas is bustling in the oil industry. 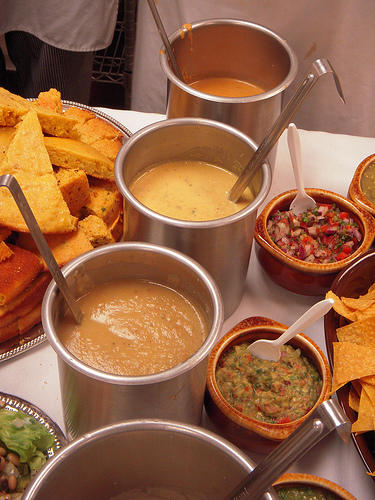 In class, our week of Tex Mex cuisine was our chance to entertain buffet style. We made all the food, piled it onto buffet tables, then invited people from other classes to come in and enjoy the spread. I was amazed at how one recipe for tortilla soup turned out 4-5 completely different soups (we cook in teams each week, most classes you are grouped in a foursome at a designated table). And even each salsa, guacamole and succotash were remarkably different. How will your tortilla soup turn out? Methods Rub onion and tomatoes with oil and grill all sides to char, 15-20 min. Put in blender, puree to smooth. Heat remaining oil; add tortilla, garlic, chili and sauté 3-4 min. Add bay/cumin/stock. Simmer. Stir in tomato mix/sauce; simmer 30 min. Season and strain, adjust seasoning. Heat to serve, garnish with chicken, cheese, avocado, crisp tortilla strips (slice corn tortilla into strips and fry in 1/2 inch of veg oil in a tiny saucepan, until crisp---or rub with veg oil and bake).